It was about 4:00 A.M., before Morning Prayer, when I saw a young man with black glasses trying to make ablution. A young man with him was trying to assist. After making ablution, his assistant took him to front lines of the mosque where he occupied his place closer to Shaykh-ul-Islam. When I had an opportunity to get close to him, I tried to avail it asking him why he was trying to get a closer place to Shaykh-ul-Islam when he was blind. He replied though he was blind, yet he was trying to get foresight getting closer to them who have its rich treasure. I was stunned down to hear his prompt and witty reply. What a way to think, to believe and cherish faith. How superior he is, far better than those who have the eyes but can not perceive truth. Today was Friday, one of the holiest days in Islamic History. Friday of the Holy Month of Ramadhan holds much more importance in the eyes of Muslims than the others. Every one tries his best to benefit and earn spiritual blessings the most on this very day. So it was Friday, the people appear more enthusiastic, alive and spirited than ever before. They were making preparations, like having showers, cladding in beautiful dresses, majority of them were wearing white ones and scenting themselves. It is the Sunnah of the Aqa (SAW) to wear white dress and scent. People from every walk of life were flocking together towards Minhaj-ul-Quran Mosque. It seems there is going to be a fair or like that. It is very amazing to note that the courtyard and nearby lawns of the mosque were crowded with people before 10:00 A.M. The management had to close the main gates of the mosque and Tehfeez-ul-Quran College two hours before the Friday prayer to avoid any unfavorable circumstance. So the late comer had to occupy their seats outside of the mosque on roads or streets in the nearby locality. It seems as if the whole city has come to gather there. So it was a vast sea of people who have come to listen to their beloved spiritual guide Shaykh-ul-Islam Dr. Muhammad Tahir-ul-Qadri. 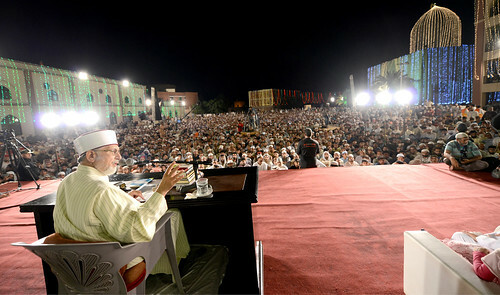 He arrived at the stage, set in the courtyard of Minhaj-ul-Quran Mosque at 1:05 P.M. The people stood up and accorded a warm welcome to the living legend. They chanted slogans in his favour and expressed their strong feelings for him. It was a worth seeing phenomenon. The people continued to chant slogans for five minutes. Shaykh-ul-Islam also waved his hands to them to express his gratitude. Shaykh-ul-Islam, in his Friday Address, shed light on the virtues of Hazrat Zunnoon Misri (Egyptian) (RA), a great Sufi and spiritualist of his time. After Friday prayer, Shaykh-ul-Islam led the funeral prayer of late Noshair Khan who passed away last night due to the heart attack. Shaykh-ul-Islam also paid a high tribute to his services for Minhaj-ul-Quran International. He said, he would be remembered for his services to Islam. He also supplicated to Allah Almighty for his final salvation. After the funeral prayer, the people rushed to the sale centre to buy Shaykh-ul-Islam's new books. There was a great rush of people and salesmen had to face difficulty till evening. After Asr prayer, Mufti Abdul Qayyum Hazarvi gave the lecture on Islamic Jurisprudence. He also answered all the questions forward by people related with different affairs of life. After Taraweeh, Minhaj youth League arranged a holy Nashid gathering in which many famous Nashid artists of national and international repute participated and promoted the love of the holy prophet (SAW). The most amazing thing was the comparing of the Programme. Sahibzada Tasneem Ahmad Sabri, a well known compare and host came from Karachi to lead and run the programme. He entertained the people in his own style. He said it was his pleasure and good fortune to do comparing in the presence of Shaykh-ul-Islam. The Programme ended at almost 3:20 just before Sahri.